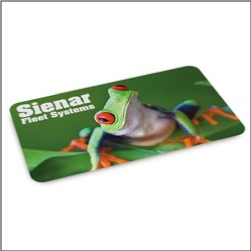 Large & Small Quantity Promotional Ad Marketing Products since 1995. 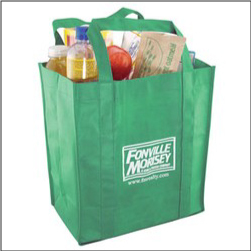 Order custom Imprinted Grocery Tote Bags – these great eco-friendly bags are perfect for reusing as grocery bags, giving out at conventions and trade shows, etc. Approx. 13inches by 15inches by 8inches. Very strong reinforced handles make these perfect for holding alot of groceries or for use at farmers markets and more. One of our most popular reusable branded tote bags! Order imprinted Custom Plastic Key Tags that offer any number of versatile ways to market your business, school boosters, organizations, and more. These tags are used across many industries: in schools as ID tags, great for school lunch programs, restaurant redeeming promotions, municipal punch card scanning, recreation and yoga studio use, grocery points redeeming, sports team fundraising, cruise and travel ids, and so much many others! Order printed Custom Full Color Microfiber Cloths that are the ideal use for smart phone cleaning, tablet and laptop screen wipes, eyeglasses and other eyewear, camera lenses, and more. 4inch x 7inch full color print. These microfiber cloths can be used by nearly anyone and are popular with many different types of businesses and organizations. Order your microfiber cloths today! 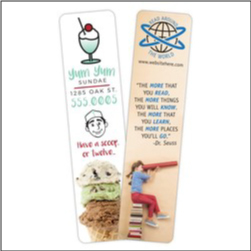 Order custom Imprinted Laminated Bookmarks – a great low cost affordable promotional item that is perfect for book and reading businesses, schools, etc. These rectangular bookmarks can be imprinted with anything and also make great rulers for schools, math class, STEM promotions, etc. Popular with hotels and travel, libraries, schools, and nearly any business or organization with books! 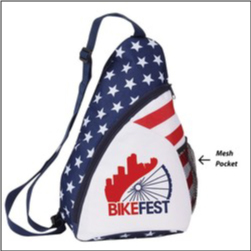 Order Custom imprinted Patriotic Sling Backpacks with a large zippered compartment and stars and stripes pattern. These great backpacks in the over the shoulder sling style feature a side mesh pocket for water bottle and and adjustable strap. Ideal for gym backpacks, day camps, daycares, hiking, events, and more. Great to be used for school and booster fundraising. 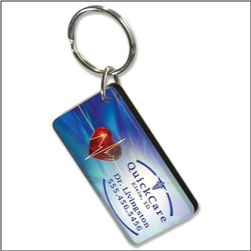 Order custom Imprinted Keychain Tags that puts your logo information in your customers hands many times a day. These tags are great for Auto Shops, Travel Businesses, custom logo with 1/8 inch acrylic keeps your info looking clear and great. Full color graphics and these tags can be cut into nearly any shape. Order custom Imprinted Aluminum Credit Card Wallets – the ideal solution for newer chip cards blocking transmissions from RFID readers – protect that personal information! Wallet contains 6 pockets accordion style and are also great for holding business cards and more. White Aluminum. Pad Print or Laser Engraving. 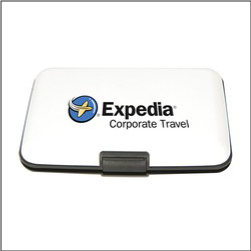 These items have a low price point and are perfect for trade show giveaways for banks, credit unions, wealth management businesses, and more. 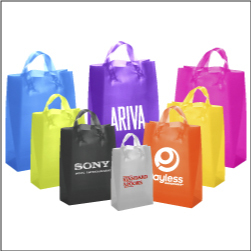 Order custom Imprinted Plastic Bags with Handles – perfect for tradeshows, events, retail businesses, and more. Bags are approx. 16 inches x 6 inches x 18 inches. Frosted colors include: clear, black, blue, lime, orange, pink, purple, yellow. Imprint colors include a variety including metallic. These bags are popular for trade shows, retail businesses, events, etc.